Thanks to Downton Abbey I may have found a cure for tatking-down-the-Chrismas Tree-melancholy. This Sunday, and I am writing this minutes after Rosemary and my cat Plata watched the first episode of this season’s Downton Abbey (I cannot stand the voice the voice of the principal butler, Charles Carson) I decided to take down our Christmas tree, By Latin-American tradition we have always done it a day after the Epiphany (January 6). I did not know what to do while Rosemary watched her program. I eyed the tree in the living room and I had the idea. As I took off the individual ornaments, I remembered where some had come from or who had given a particular one to us. But for most I had no memory. I lay them all on our red Christmas tablecloth in our dining room and suddenly came up with the idea of what you see and read here. The origami swan on the left is one of a set of six assembled one Christmas Eve (perhaps five years ago) by our friend Abraham Rogatnic. He assembled them while my two granddaughters, Rebecca and Lauren watched. Sliding in on the right is a tin death I bought in Mexico. Every year my friend, poet and writer Homero Aridjis sends me a colourful tin ornament. In December of 2012 I purchased this one at the Mexican Museum of Popular Art. With me and buying and identical one was the poet himself. The brass duck, the wooden horse and the wooden tree all came in different years from Book-of-the-Month Club when I was a member. On the bottom left is a pewter Santa. I have four from a set I purchased when Seagull Frames (Pugwash, Nova Scotia) existed as a Canadian Company. They are now American and do not make little ornaments or themed and ornate frames of which I have a nice collection with pictures of our family. 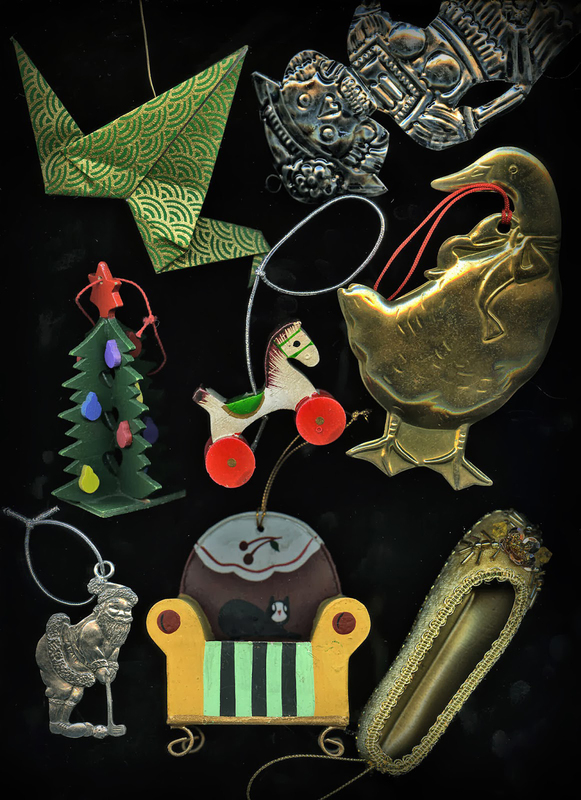 In bottom centre, from a set of two is an ornament given to us by our friend, the graphic designer Graham Walker. You might note that there is a black cat sitting inside the sofa. At the time we had Mosca, a black cat. The lovely ballerina slipper leaves me with a blank. Removing the ornaments as I walked by concentrating Rosemary on her program was pleasant and it made me forget that I had to feel melancholic. I cannot wait for Season V of Downton Abbey.